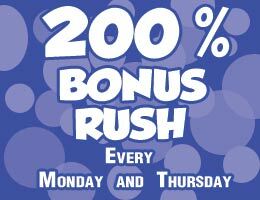 Get a massive 200% Bonus as soon as you deposit $100 or more every Monday and Thursday. Please note: This offer is only valid for players who have made 4 or more deposits since the date of registration. All deposits under $100 will receive the regular funding bonus. New players are entitled to the first deposit funding bonus. 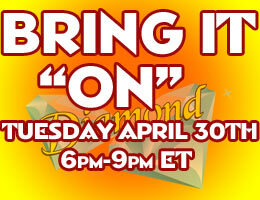 Bring it Ã¢â‚¬Å“ONÃ¢â‚¬Â will commence on Tuesday April 30th from 6pm - 9pm ET. You can win between 5BB's and 10BB's when you play the Bring it Ã¢â‚¬Å“ONÃ¢â‚¬Â chat special! 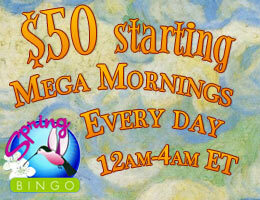 Here at BingoSKY we give you daily opportunities to win real cash! The Bingo Free Roll Room is definitely the place to be. The room is open from Monday - Thursday from 4pm - 1am ET and from Friday to Sunday from 12pm - 1am ET. 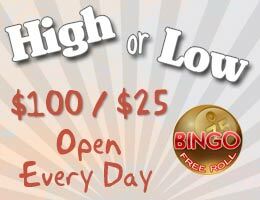 Play our High or Low $100/$25 Games which take place every hour! Check out our game schedule for more information on other games playing in the Bingo Free Roll Room.